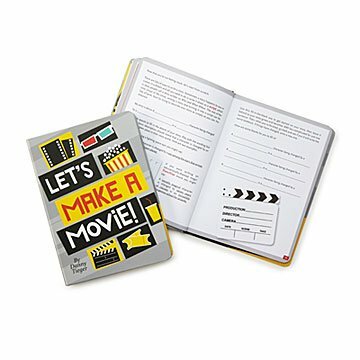 This step-by-step book teaches kids the process and storytelling skills to make awesome, satisfying films. Almost any kiddo can shoot a two-minute video of Fluffy or Fido being adorbs. But how many can make an enjoyable film that tells a story? This step-by-step book teaches kids the process and storytelling skills to make videos they're proud of. Packed with tips, tricks, and info, it will help kids develop the confidence to use their imaginations and get their ideas onto film. The book also includes a fun Long Weekend Short Film Genre Challenge—kids can make a ghost story, comedy, action drama, superhero tale, or a documentary. There's plenty of place for writing ideas and storyboarding, too. The yellow brick road to film greatness starts here! (Steven Spielberg made his first film at age 12. Just saying.) Made in China. Allows children to use their imagination to create stories. To cut up cardboard boxes with ease.